Today for #SundaySupper we are sharing with you our hometown favorites. Well I currently live in Northern California, but I am originally from Buffalo, NY. So today I thought I would share with you a Buffalo favorite and I bet you can guess what that is, Chicken Wings! That is one thing I miss from Buffalo is chicken wings, pizza, roast beef, sponge candy and good old Italian restaurants. One thing Buffalo has going for its self is the food. I’m drooling thinking of it. It’s worth trip to good old Buffalo just to eat. Just don’t do it in the winter time as you may know they get their fair share of snow. That is one thing I do not miss! So today, I am taking my Buffalo favorite and healthifying it a tad bit by baking my chicken wings. I have grilled chicken wings before, but I never baked them. I have to say they turned out juicy, crisp and simply perfect. I couldn’t stop eating them. I was a little concerned that baking them, that they would lose all of their chicken wing charm, but it didn’t. I can’t believe they actually turned out crispy. For baking them, I placed them on a baking rack on my baking sheet. Here is an Instagram shot I took of the wings before they went in the oven. For the hot sauce I used Franks Hot Sauce. That to me is the original sauce for chicken wings. When I was 18 I used to work in a pizzeria and we used Franks Hot Sauce for the wings. It’s the only way to go! The recipe is so easy and is only 3 ingredients; butter, hot sauce and chicken. I bought my chicken with wing and drumstick attached. Just cut the wing with kitchen scissors between the wing and drumstick and cut the wing tip off. So easy, it took like 2 minutes to do this. For the calories, it is less than what I am sharing with you. I threw out the wing tips and I know that the calories are different between the wing and drumstick. To make the wings I just placed them in my broiler and cook for 12 minutes, flip and cook for another 10 minutes, until crispy. No greasy mess and no smelly fried foods. I hate the smell of fried foods. I will bake whenever I can. Plus honestly, I can’t eat friend foods anymore, except french fries, it just doesn’t agree with me. 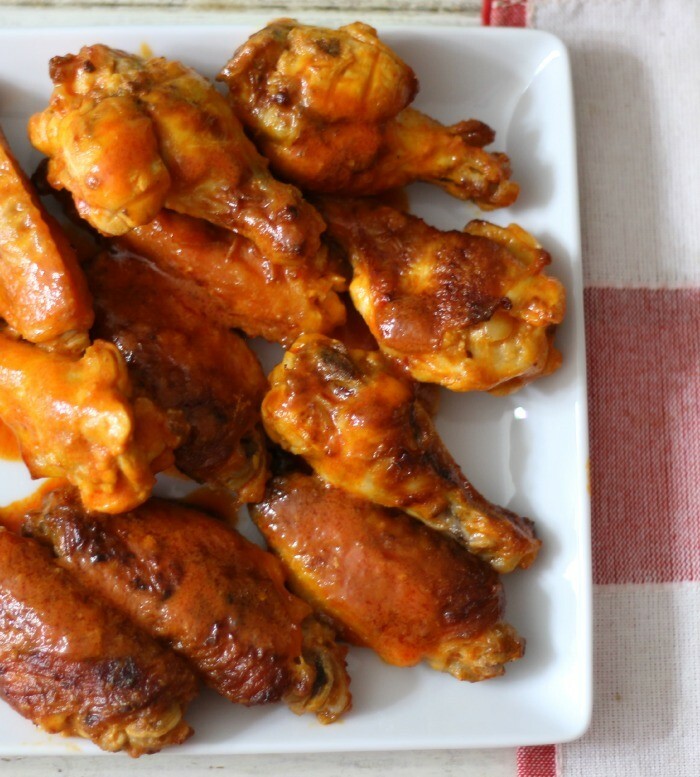 Traditional Buffalo Chicken Wings made healthier by baking and not frying. Made with Franks Hot Sauce and butter. The perfect appetizer! In a microwave safe bowl (I found a Pyrex measuring cup works great), melt butter; approx 45 seconds. Stir in hot sauce and mix until well combined. Place chicken wings in a bowl and add half of the hot sauce mixture. Reserve the remaining sauce for coating at the end. Let the wings sit at room temperature for 20 minutes. Place a piece of aluminium foil on a baking sheet, and spray with cooking spray. Add a baking rack over the baking sheet,and spray with cooking spray; add the chicken wings. You do not need the baking rake, but I found it works best so the oil can drip onto the baking sheet, but it is not necessary. Place the chicken in the oven and broil for 12 minutes, flip and broil for another 10 - 12 minutes, until the skin is crispy. Re-heat the hot sauce until warm; about 30 seconds. Coat the chicken in the remaining hot sauce. Serve hot with blue cheese and celery. Please note, that I clipped the wings and the calories are less than what is in this recipe. I tried to calculate it the best I can on this one. Next time you are in the mood for chicken wings, try baking them. I don’t think you will be disappointed. By the way this recipe makes a dozen chicken wings, but by all means double it up. Be sure to check out the #SundaySuppers hometown favorites. By the way, what is your hometown favorite food? I’m so glad you shared this baked recipe for wings. All that grease from frying is so not needed and the butter flavor really comes through. Don’t you just miss the food from Buffalo? Franks Hot Sauce is the only way to go for traditional Buffalo wings in my mind! I love buffalo wings! They are a must-have at every party. I have to agree! One one of my favorite indulgences! Nothing like good chicken wings! I love that you baked them. I have to give that a try. Definitely try them baked, they are delish! Thank you so much Liz! I can’t believe how good they turned out baked! These buffalo wings look finger-lickin’ good! Without Buffalo, there would be no wings! These looks so good, a great hometown recipe! Beautiful wings, Jennifer! I was introduced to the real Buffalo wings by another friend from Buffalo when I was living in Kuala Lumpur. She had to special order the Frank’s Hot Sauce because she said it was the only way to make them right! Yup, Franks Hot Sauce is the only way to go. I love that these are baked! They look absolutely delicious; going to try these soon! Hi Valerie! Thank you for the compliment. I use Easy Recipe plug-in. I also bought the addition to add the photos. I have been happy with this plug-in. My cousin in from Buffalo and his parents always bring him Franks Hot Sauce. AMAZING! 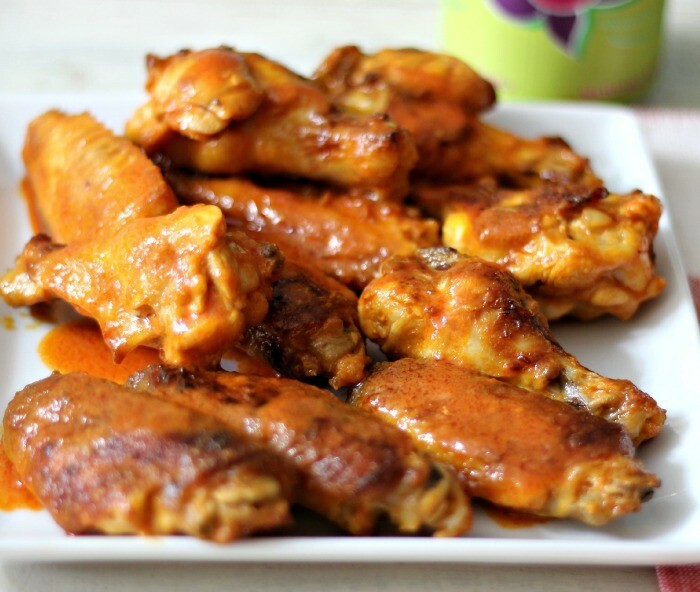 I love that you baked your wings….yummy! You sure got Buffalo right! Thanks so muchf or sharing! I’d take a baked chicken wing over fried any day (well, if I still ate chicken lol). Yep, I guessed you were from Buffalo, NY!! I love that you baked the wings, I’m saving this recipe for reference. I’ve always fried my wings, which is delicious of course, but it does mean I can’t have them very often. Thanks for posting! Love that these wings are baked — they look as golden and crispy as the fattier fried ones!! Thought you were a Cali girl through and through, Jennifer =) Very glad you are from Buffalo as I do appreciate the recipe =) And soooo very thoughtful of you to leave the nutritional value for those of us working on health issues with nutritionists =) I’ve clipped your recipe and so glad I get to enjoy deliciousness and good eating thanks to you! 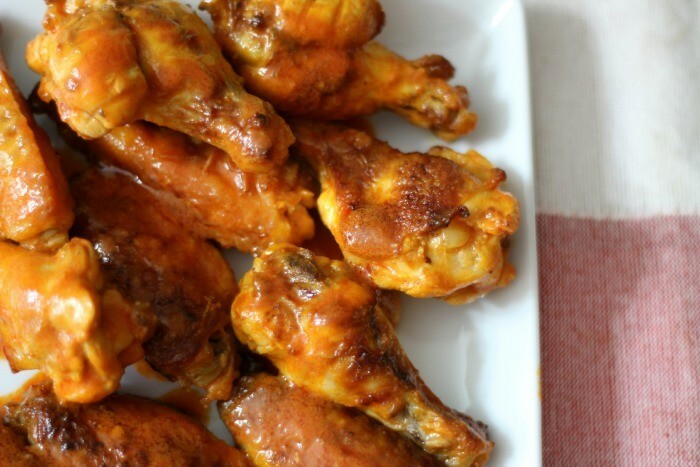 I’ll have to share this recipe with friends who love chicken wings but are eating healthier. Pinned! Ohhh butter! I usually just use the hot sauce but that’s brilliant! 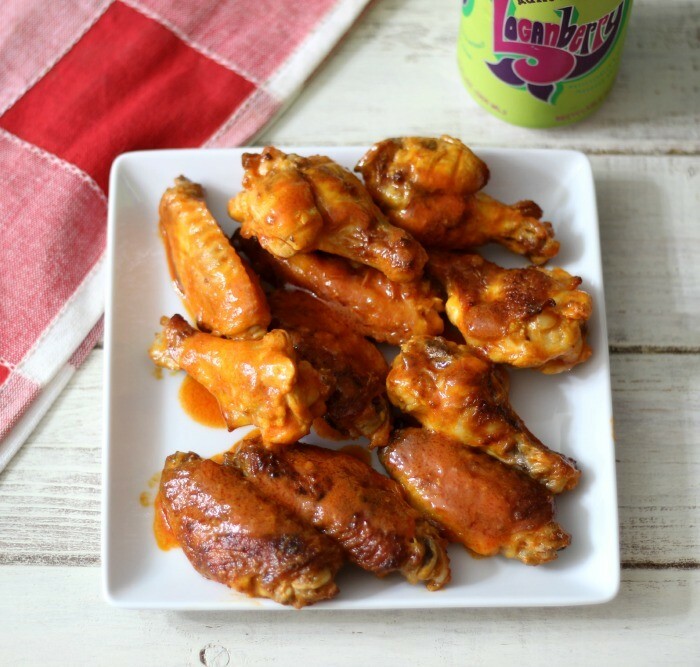 What perfect wings…these look fabulous! Baked wings are my favorite. These look delicious! I’m a sucker for some killer wings and those look like KILLER wings! YUM!! 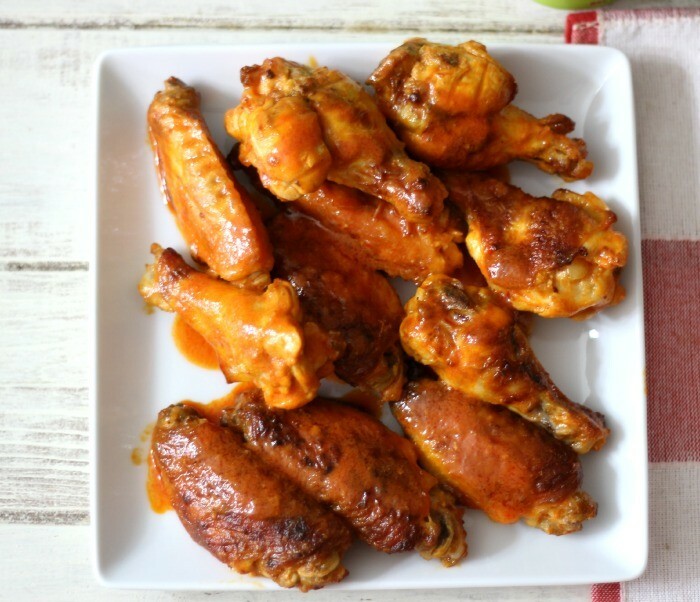 Love buffalo chicken wings, your’s look delicious! Baked Hot Wings are a favorite around our house! I can never pass on wings! My guy is a Sabres fan and I’m a wing fan this is perfect to me! I am from Buffalo as well and these look AMAZING! Just earlier I was thinking about all of the foods I miss from Buffalo…especially beef on weck and Redlinski’s sausage. Now I know what is for dinner tonight 🙂 Love your blog! Thank you so much Anne! I almost forgot about Redlinski’s sausage, oh my gosh yum! You have me craving all my Buffalo favorites. I plan on trying to make my own Beef on Weck soon. I’m also from Buffalo and miss the wings. Thanks for the healthier way to eat them. I could eat buffalo wings on a daily basis . . . but oh my goodness, fried they are so bad for me . . . but baked? Wow, I must try this recipe! Thank you for sharing!